The Knight XV from Conquest Vehicles wasn’t designed with the undead in mind (at least we don’t think that it was) but the mega-SUV is perfectly suited to the task at rotting hand. 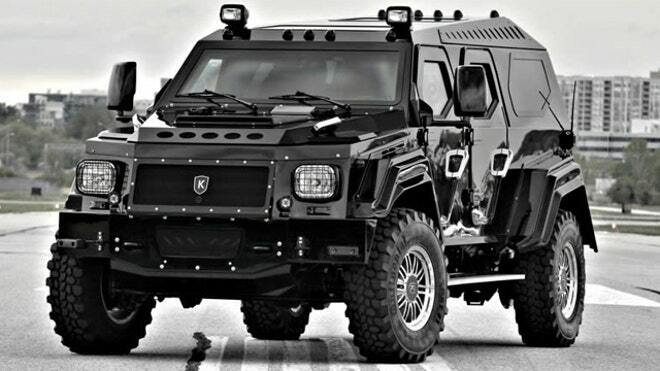 About twice the size of your typical HUMMER, the fully-armored truck could likely survive an assault by Team 6, let alone cracked fingernails. Its opaque bullet-proof glass will keep you out of sight of glazed-over eyes, while ballistic run-flat tires should have no problem driving over the unkempt, bone-strewn streets of your town. It even runs on bio-diesel, so when the supplies run dry you can make your own fuel. Night-vision surveillance cameras and an external listening device serve as an early warning system and a high-power roof-mounted spotlight is just the ticket in case a few vampires find their way into the mix. Hey, you never know. Granted, the price of survival is high at $300,000, but that’s about how much a three-bedroom costs in Pittsburgh – the location of “Night of the Living Dead” – and you won’t need one if you drive one of these. Its interior is upholstered in leather and Wilton Wool, comes with a flat-screen TV, refreshment bar and satellite TV to pick up the signal from any other survivors who might be out there. Unfortunately, there’s no bathroom, so good luck with that. But it does come with a cigar humidor so you can live the good life to the fullest while you’re still alive. Hurry up, though, only 100 will be made and you don’t want to be the one stuck driving around in a convertible. At his first court appearance, defense attorney Lynne McChrystal requested that reasonable bail to be set in the case, adding that Kinyua has been in Harford County for six years and in Marylandfor nine years. He is self-employed and performs consulting work, she added. Then on May 20, Kinyua, who otherwise does not have a criminal record in Maryland, was charged with first-degree assault and reckless endangerment in Baltimore in connection with an incident that allegedly occurred May 19 at the Thurgood Marshallapartments, according to court records. In that case, according to police, Kinyua “randomly” attacked another Morgan State student in a doorway of the apartment complex with a baseball bat, then fled into a nearby wooded area. The victim, listed as Joshua Ceasar, suffered fractures to his skull, arm, shoulder, as well as blindness to his left eye. The first responding officer saw Ceasar stumbling toward her, with blood coming from his forehead, and the officer noted a large amount of blood in the doorway. Kinyua was ordered held on $220,000 bond in that case, and university officials said the school was in the process of expelling him. It also states a fundraising event was scheduled at the International Christian Community Church on Sunday. He was scheduled to appear at a preliminary hearing in that case June 19. Jasmine Bloomfield said Kinyua was known around campus – “he was always all around campus involved with things” – but often acted strangely. He was “always in his own little world, preaching everywhere he went and talking about how he was writing a book.” Once, she said, he got up during a screening of a documentary and started yelling about the struggle of black people. But his page also shows Kinyua in the fall smiling at a campus event for student organizations, showing off a jacket for the National Society of Pershing Rifles, which according to its website is a fraternity for students in Reserve Office Training Corps program. Late Wednesday, a man who answered a phone at the number listed said Antony and Beatrice Kinyua were “resting,” and that the family did not wish to speak to the media without an attorney present. WHAT’S THE MOST SATISFYING WAY TO KILL A ZOMBIE? a) Baseball Bat b) Machete c) Shotgun d) Liquid Nitrogen e) Wood-Chipper. The BASEBALL BAT (aka: Louisville Slugger) is great for that up-close and personal touch. Whether you use wood or aluminum, be advised, after a good head-bashing, you might experience a temporary tingling or numbness in your wrists. The MACHETE, a cross between an axe and a knife, is a good multi-use tool. Downside: Constant practice and blade-sharpening can seem like chores. QUICK TIP: If you must have a machete, get a Kukri (central Asia) or the Tapanga (Africa). On the other hand, for elegance, precision, and stealthy silence, nothing beats the Japanese Katana sword – think Highlander. The SHOTGUN. It gives new meaning the the term: “Scatterbrained”. But seriously folks, what’s not to like about a pump-action, Mossberg 500 – it’s an American Classic. Downside: Shotgun blasts are messy and very loud. LIQUID NITROGEN. Yes, it’s very “out-of-the box” thinking but it’s also very complicated and it wouldn’t actually kill a zombie as much as slow it down. The WOOD-CHIPPER. Granted, they’re not cheap and coaxing the undead inside one can be tricky. On the other hand, nothing is more satisfying then seeing the total (million tiny bit) annihilation of a zombie. Oh yeah, Zed is dead.